I pass through a security gate, and as I round the corner of the curved drive a grand entrance greets me. Tall palm trees and colorful potted Bougainvillea in shades of pink ranging from soft and pale to bright and vibrant flank each side of the entrance. A doorman quickly emerges from the foyer, greeting me as he opens my car door. 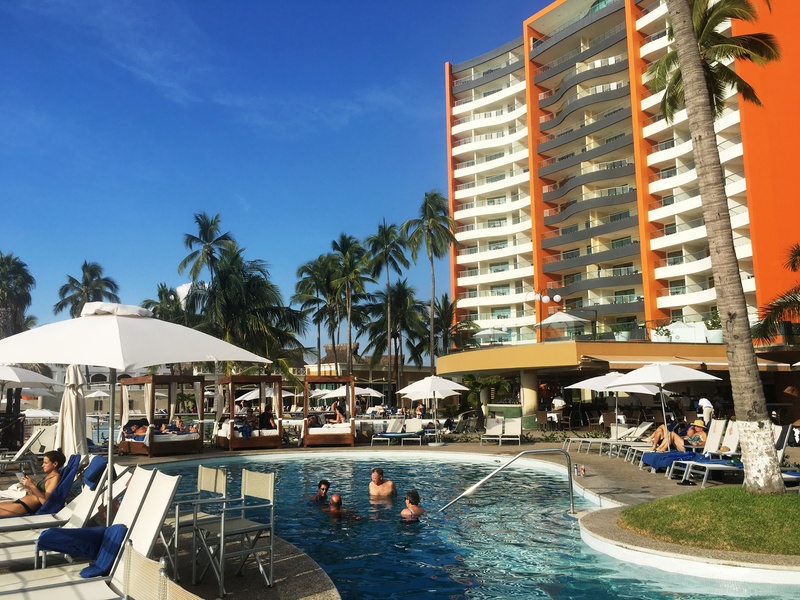 The interior of the Plaza is decorated in beautiful earth-tones that reflect Puerto Vallarta’s sunsets, the blue hues of the ocean, and its colorful Mayan history. One of the perks I love about staying at an all-inclusive resort, I can eat as much and often as I want without additional charges. The restaurant served delicious breakfasts with fresh fruit, pastries, and omelets made special to my request. fried bananas with eggs? Yes, please! While I was at Sunset Plaza I made sure to take advantage of their Spa. I enjoyed a relaxing aromatherapy massage on the edge of the water in a cozy little cabana. I had always wanted to experience a luxurious massage with the sound of the waves splashing against the beach. It was just as I had imagined, soothing and relaxing. I had been eyeing the giant chess game displayed in the yard since I first arrived at the hotel. After my relaxing massage, I decided to challenge myself to a match. I gotta say, it was a tough game. I had a fierce competitor, but in the end, I was the victor. Sunset Plaza has multiple pools connected to each other. I loved that they overlooked the ocean and I could watch the waves and boats in the bay. The concierge told me that sometimes there are also dolphins that play and jump in the bay, I kept waiting for them, but alas, it was not to be this trip. The main pool had a swim-up bar, the mixologist blended a yummy tropical frufru drink for me, complete with an umbrella. I felt like a movie star in John Huston’s 1964 film Night of the Iguana starring Elizabeth Taylor and Richard Burton. Conveniently located in the middle of the Hotel Zone of Puerto Vallarta, Sunset Plaza is a short walk to a bus station. From the main gate, I was able to walk a couple of city blocks to the station where I took a bus to the beautiful historic downtown district. Mexican buses are a safe and efficient way to get around. For 8 pence, I rode the bus from the hotel district to the beautiful historic downtown. Taxis are also an option, although not as cost effective as the bus. The same trip from the Plaza to downtown cost me roughly 20 pence, but the return trip to the hotel cost 120 pence. I enjoyed my stay at the Sunset Plaza. The staff was friendly and helpful. I cannot wait to visit again.